It’s a sad day at Nana’s house today. 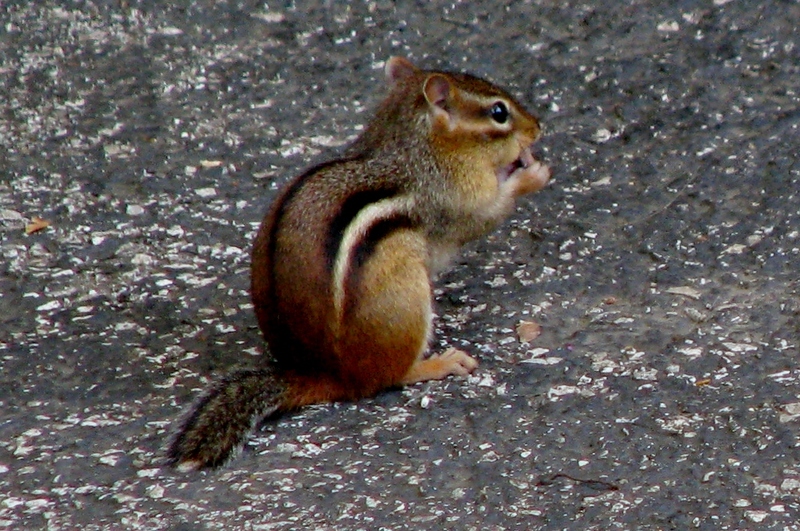 Chippy the Chipmunk had a face to face encounter with Día and Joe Bear underneath the bird feeder. Joe Bear was trapped up on the deck and just about ready to lunge down about 15 feet to join his canine friend in her excitement when I stepped outside and opened the gate. By the time Joe had barreled down the stairs, the little chipmunk was cornered under the downspout. Chippy never had a chance. Día and Joe Bear had him boxed in completely. While Día was the ultimate in the hunting category this time, she happily delivered up her prize to the much larger and demanding Joe Bear. You would think HE caught the poor little guy, Chippy wasn’t even as big as that hulking bear-dog’s paw. Joe pranced around the yard as if he was showing his adoring fans what he had accomplished. And then he plopped down to toy with his fatally flawed friend. Ummm, no, I don’t think so. I started to back Joe into a submissive stance. He reluctantly dropped his prey. But I could tell he was just waiting me out. Ha! As if! My daughter, who has a mixed hate-love relationship with animals anyway, cannot stand the animal-side of our dogs. You know, they smell like dogs. Act like dogs. Annoy like dogs. And they protect us from varmints like…Chippy and little birds…And the coyotes, raccoons, foxes and all the other assorted critters that like to wander in for a sneak of food…They are, after all, animals and have animal natures and instincts. Are you distracted by your food? My husband and I celebrated our 32nd wedding anniversary last week. A few days after the actual date, we went out for dinner at The Cheesecake Factory. I know…cheesy. But seriously, they have an awesome dinner menu and I really wanted some great cheesecake, since finding good pies is a bit of a challenge without Tippins around anymore. My husband, sweet man that he is, dropped me off at the door and went to park the car. For those of you reading this blog from or familiar with the St. Louis area, you will understand that parking at The Galleria can be troublesome, and that evening was no exception. I was seated immediately (awesome) and began looking over the menu. Ahem, it was more like a paperback novel, to be honest. I chose something from the Skinnylicious menu before my husband came in…so I was all set to order when the server appeared to take our order. She rattled off the specials, and I instantly changed my mind and decided on the Pecan-crusted Catfish with mashed potatoes and succotash. My husband, notorious for NOT being quick about things like ordering at a drive through window, or any restaurant for that matter, was still trying to figure out how the menu worked. He asked questions about the soups offered on the specials of the day. Not just what kinds, but the quantity served. Cup? Bowl? Pot? Not really, he didn’t mention the pot. He asked his go to #1 choice–do they serve Lasagna. Nope. I could have told him that–I had already checked for him. 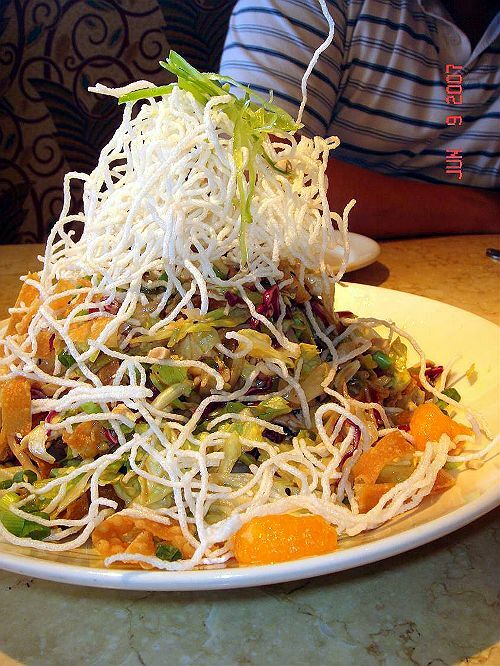 He then asked for his go to #2 choice–the Chinese Chicken Salad. SCORE!!! I could have, and probably should have, ordered for him. Time is money, especially in the restaurant business. We talked for a little while as we awaited our dinner. As we are in the middle of a kitchen re-vamp, there was no shortage of topics needing our attention. It was pleasant and we just enjoyed our time. Then the food arrived. I was eating my dinner, thoroughly enjoying each bite. Finally, I asked my husband how his salad compared to the many other Chinese Chicken Salads he has eaten over the years. Even after all the years we’ve been married, his answer surprised me. Ok, seriously, he’s DISTRACTED by the contents of his salad so he can’t tell if he likes it more than, equal to, or less than the thousands of others he’s had? Wow. Just wow. I guess in HIS mind, the noodles added nothing of value to the salad, so just for the sake of presentation, they were not worth it. If you look at the salad in the same way you might look at the Gospel, it makes tremendous sense. The simplicity of the Gospel is its beauty–it needs nothing else to make it more attractive or valuable. The truth of Jesus coming to die on the cross as full payment for the sins of all who would take His gift of salvation is beautiful. Complete. It stands alone without the need for anything we could even hope to add to it. 4-10 But even though we were dead in our sins God, who is rich in mercy, because of the great love he had for us, gave us life together with Christ—it is, remember, by grace and not by achievement that you are saved—and has lifted us right out of the old life to take our place with him in Christ in the Heavens. Thus he shows for all time the tremendous generosity of the grace and kindness he has expressed towards us in Christ Jesus. It was nothing you could or did achieve—it was God’s gift to you. No one can pride himself upon earning the love of God. The fact is that what we are we owe to the hand of God upon us. We are born afresh in Christ, and born to do those good deeds which God planned for us to do.